In this lesson, we will learn how to apply Newton’s second law when the forces acting on a body and the motion caused by them are represented in the vector notation. If a body of mass 1 kg moves under the action of forces ⃑ 𝐹 =  ⃑ 𝑖 + 8 ⃑ 𝑗 − 5 ⃑ 𝑘  1 N and ⃑ 𝐹 =  2 ⃑ 𝑖 − 7 ⃑ 𝑗 + 8 ⃑ 𝑘  2 N , what is its acceleration? A body of mass 11 kg is moving such that the horizontal and vertical components of its velocity are given by 𝑣 = 4 𝑥 and 𝑣 = − 9 . 8 𝑡 + 1 2 𝑦 where 𝑣 𝑥 and 𝑣 𝑦 are measured in metres per second. Find the force ⃑ 𝐹 , in newtons, that is acting on the body during its motion and the body’s initial speed 𝑣 0 . A body of mass 3 units was moving under the action of two coplanar forces ⃑ 𝐹 1 and ⃑ 𝐹 2 such that ⃑ 𝐹 = 𝑎 ⃑ 𝑖 + 4 ⃑ 𝑗 1 and ⃑ 𝐹 = − 4 ⃑ 𝑖 + 𝑏 ⃑ 𝑗 2 , where ⃑ 𝑖 and ⃑ 𝑗 are two perpendicular unit vectors. Given that the acceleration of the body is 2 ⃑ 𝑖 − 4 ⃑ 𝑗 , find the values of the constants 𝑎 and 𝑏 . A particle of mass 𝑚 kg is moving under the action of two forces: ⃑ 𝐹 = 8 𝑚 ⃑ 𝑖 + 6 𝑚 ⃑ 𝑗 1 and ⃑ 𝐹 = 4 𝑚 ⃑ 𝑖 2 , where ⃑ 𝑖 and ⃑ 𝑗 are two perpendicular unit vectors. 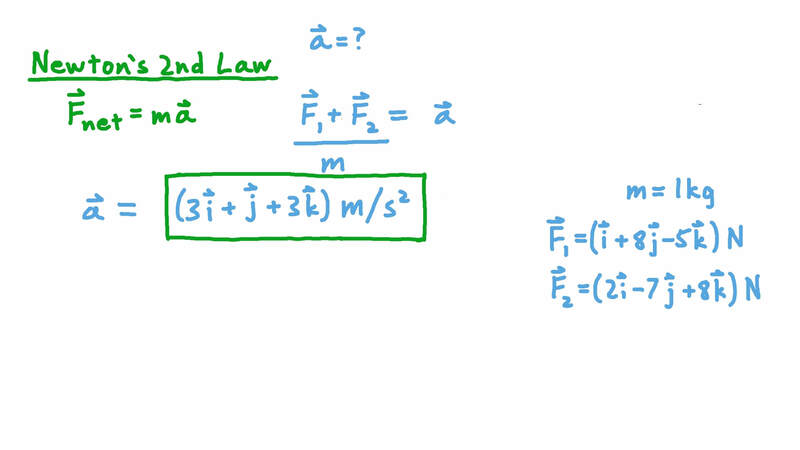 Find the acceleration ⃑ 𝑎 of the particle and its magnitude ‖ ‖ ⃑ 𝑎 ‖ ‖ in metres per second squared. If the forces ⃑ 𝐹 =  𝑥 ⃑ 𝑖 + 𝑦 ⃑ 𝑗 + 𝑧 ⃑ 𝑘  1 N and ⃑ 𝐹 =  − 5 ⃑ 𝑖 − 6 ⃑ 𝑗 − 3 ⃑ 𝑘  2 N acting on a body of mass 6 kg, cause an acceleration ⃑ 𝑎 =  5 ⃑ 𝑖 + 2 ⃑ 𝑗 − 4 ⃑ 𝑘  / m s 2 , what are the values of 𝑥 , 𝑦 , and 𝑧 ? Given that the motion of a body of mass 2 kg is represented by the relation ⃑ 𝑟 ( 𝑡 ) =  6 𝑡 + 1 5 𝑡 + 2  ⃑ 𝑐 2 , where ⃑ 𝑐 is a constant unit vector, ⃑ 𝑟 is measured in metres, and 𝑡 is measured in seconds, determine the magnitude of the force acting on the body. A body of unit mass was moving under the effect of a force ⃑ 𝐹 = 𝑎 ⃑ 𝑖 + 𝑏 ⃑ 𝑗 , where ⃑ 𝑖 and ⃑ 𝑗 are two orthogonal unit vectors. If the displacement vector of the body at time 𝑡 is given by ⃑ 𝑠 ( 𝑡 ) = ( 9 𝑡 ) ⃑ 𝑖 + ( 𝑡 + 3 ) ⃑ 𝑗 2 2 , find 𝑎 and 𝑏 . A particle of unit mass was moving under the effect of three forces: ⃑ 𝐹 = 𝑎 ⃑ 𝑗 1 , ⃑ 𝐹 = − ⃑ 𝑖 2 , and ⃑ 𝐹 = 2 ⃑ 𝑗 + 𝑏 ⃑ 𝑖 3 , where ⃑ 𝑖 and ⃑ 𝑗 are two perpendicular unit vectors and 𝑎 and 𝑏 are constants. If the displacement vector of the particle as a function of the time is given by ⃑ 𝑠 ( 𝑡 ) = 6 ⃑ 𝑖 + ( − 4 𝑡 + 4 𝑡 ) ⃑ 𝑗 2 , find the values of 𝑎 and 𝑏 . A body of mass 9 g was moving on a plane under the effect of the force ⃑ 𝐹 =  − ⃑ 𝑖 − 1 0 ⃑ 𝑗  dynes. Given that the position vector of the body is given by the relation ⃑ 𝑟 ( 𝑡 ) =   𝑎 𝑡 + 7  ⃑ 𝑖 +  𝑏 𝑡 + 6 𝑡  ⃑ 𝑗  2 2 c m , determine 𝑎 and 𝑏 . A body of mass 7 kg moves under the action of three forces, ⃑ 𝐹 =  𝑎 ⃑ 𝑖 + 3 ⃑ 𝑗  1 N , ⃑ 𝐹 =  6 ⃑ 𝑖 − 6 ⃑ 𝑗  2 N , and ⃑ 𝐹 =  6 ⃑ 𝑖 + 𝑏 ⃑ 𝑗  3 N . Given that the displacement of the particle at time 𝑡 seconds is ⃑ 𝑠 =   𝑡 + 6  ⃑ 𝑖 +  5 𝑡 + 5  ⃑ 𝑗  2 2 m , determine the values of 𝑎 and 𝑏 . A particle of unit mass is moving such that its velocity at a given time 𝑡 is represented by ⃑ 𝑣 ( 𝑡 ) =  8 𝑎 𝑡 + 5 𝑏 𝑡  ⃑ 𝑖 2 , where ⃑ 𝑖 is a constant unit vector. Given that the force acting on the particle at time 𝑡 is ⃑ 𝐹 ( 𝑡 ) = ( 1 0 𝑡 + 4 ) ⃑ 𝑖 , find 𝑎 and 𝑏 . A particle of unit mass is moving along a certain path, where its velocity at time 𝑡 is given by the relation ⃑ 𝑣 =  𝑎 𝑡 + 𝑏 𝑡  ⃑ 𝑖 2 , where ⃑ 𝑖 is a constant unit vector. Given that the force acting on the particle is constant and given by the relation ⃑ 𝐹 = 9 1 ⃑ 𝑖 , determine the values of the constants 𝑎 and 𝑏 . A body of mass 250 g moves under the action of a force, ⃑ 𝐹 newtons. Given that the body starts from rest at the origin, and ⃑ 𝐹 = ( 9 𝑡 + 3 ) ⃑ 𝑖 + 9 𝑡 ⃑ 𝑗 , where ⃑ 𝑖 and ⃑ 𝑗 are perpendicular unit vectors, find the displacement in terms of 𝑡 . A particle of mass 5 kg was in motion. The components of its velocity in the horizontal and vertical directions were 𝑣 = 3 / 𝑥 m s and 𝑣 = ( − 4 . 7 𝑡 + 1 4 ) / 𝑦 m s , respectively. Determine the magnitude, 𝑣 0 , and direction, 𝜃 , of its initial velocity and the force ⃑ 𝐹 acting on it. A body of mass 𝑚 is moving under the action of a force F . Its velocity at time 𝑡 seconds is given by the relation v i ( 𝑡 ) = ( 6 𝑎 𝑡 + 𝑏 ) / m s , where i is a unit vector in the direction of its motion, and 𝑎 and 𝑏 are constants. Given that the initial velocity of the body v i  = 1 5 / m s and F i = ( 1 2 𝑚 ) N , find the body’s speed at 𝑡 = 1 4 s e c o n d s .
Three forces, ⃑ 𝐹 =  𝑎 ⃑ 𝑖 + 4 ⃑ 𝑗 − 9 ⃑ 𝑘  1 N , ⃑ 𝐹 =  3 ⃑ 𝑖 − 8 ⃑ 𝑗 + 𝑐 ⃑ 𝑘  2 N , and ⃑ 𝐹 =  4 ⃑ 𝑖 + 𝑏 ⃑ 𝑗 + 8 ⃑ 𝑘  3 N , where ⃑ 𝑖 , ⃑ 𝑗 , and ⃑ 𝑘 are three perpendicular unit vectors, are acting upon a body of unit mass. If the displacement vector of the particle is ⃑ 𝑠 =  ( 4 𝑡 ) ⃑ 𝑖 +  6 𝑡 + 3 𝑡  ⃑ 𝑗 +  8 𝑡 + 7  ⃑ 𝑘  2 2 m , determine the constants 𝑎 , 𝑏 , and 𝑐 . A body of mass 478 g has an acceleration of  − 4 ⃑ 𝑖 + 3 ⃑ 𝑗  m/s2, where ⃑ 𝑖 and ⃑ 𝑗 are perpendicular unit vectors. What is the magnitude of the force acting on the body? A body of mass 1 kg was moving in a straight line with a velocity ⃑ 𝑣 =  8 ⃑ 𝑖 − 8 ⃑ 𝑗  / m s , where ⃑ 𝑖 and ⃑ 𝑗 are two perpendicular unit vectors. The force ⃑ 𝐹 =  − 4 ⃑ 𝑖 − 5 ⃑ 𝑗  N acted on the body for 8 seconds. Find the body’s speed after the action of this force. A body of mass 2 kg moves in a horizontal plane in which ⃑ 𝑖 and ⃑ 𝑗 are perpendicular unit vectors. At time 𝑡 seconds ( 𝑡 ≥ 0 ) , the force acting on the particle is given by ⃑ 𝐹 =  ( 8 𝑡 − 8 ) ⃑ 𝑖 + ( 4 𝑡 − 3 ) ⃑ 𝑗  N . Find the speed of the body, 𝑣 , and its distance from the origin, 𝑑 , when 𝑡 = 3 s .